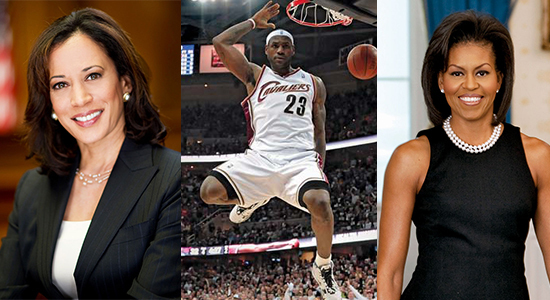 Senator Kamala Harris, basketball star Lebron James, and First Lady Michelle Obama. The following activities are created with classrooms of all levels in mind and work best when paired with Britannica School. Contact your library staff to see if your institution already has access or claim your own Britannica School Free Trial. This Black History Month, introduce students to some modern history-makers with these Britannica School activities. Every February since 1976, the United States has celebrated the achievements and contributions to history made by notable African Americans with Black History Month. This month’s classroom activities shine a spotlight on African Americans who are making a difference today. Meet the living role models who are breaking barriers and shifting paradigms. Let’s take contemporary household names that we follow on Instagram, watch on Snapchat, and read about in the news—such as John Legend, Kamala Harris, Michelle Obama, and Lebron James—out of our feeds and into the classroom to learn about their lives and contributions. Ruby Bridges speaks with U.S. President Barack Obama at the White House in 2011 about a Norman Rockwell painting, The Problem We All Live With. The painting depicts Bridges at age six, walking to school under the protection of federal marshals in New Orleans, Louisiana. She was the first African American child to attend an otherwise all-white school, and she faced considerable racism. Expand cultural literacy through rap music with a one-hour playlist that’s squeaky clean for classroom listening. The Clairvoyant Kids vocabulary strategy activates students’ prior knowledge regarding domain specific vocabulary and concepts. Differentiation Station: Google Classroom and Britannica—Together at last! Facilitating differentiation for your students is easier than ever now that Google Classroom and Britannica are a team.